If you have followed my material over the years, there is a good chance that you have heard me ramble on about the importance of patience. Without patience, significant results are nothing but a fairy tale. There are no shortcuts or overnight miracles. Real strength requires a significant investment in time. Yet despite my efforts, my voice is nothing but a faint whisper in an industry filled with noise. Patience is not for sale so it will never be a heavily marketed attribute. People want results yesterday, not a year from now, so the industry will continue to satisfy this demand even if it means offering false promises and hope. Consequently, many people have, and will continue to fall prey to the deceptive marketers who counter the importance of patience. I have even had people write me to criticize my emphasis on patience. Apparently, I struck a chord by stating that real results take time. Some people just don’t want to believe it. Recently, one such person actually wrote to me asking if I lived in the woods without cable television. He sarcastically made this comment before mentioning The Biggest Loser. He stated that the show provides evidence to counter my beliefs regarding patience and time. Sadly, it is not the first time that this show has been used to counter my suggestions. Ironically, a few days after reading his email, I came across the following article from the New York Post. I don’t typically read the NY Post but this particular article is well worth a look. It essentially outlines what most credible trainers already know to be true. In short, there is no safe or healthy way to drastically drop significant amounts of weight. I can all but guarantee that many contestants from the show have endured similar circumstances to what is outlined within the story. Once again, slow and steady wins the long term race. I wanted to share this NY Post story to make more people aware of what really goes on in Hollywood. As the old saying goes, if it looks too good to be true, it probably is. And once again, I am not suggesting that you cannot make some improvements in a short period of time. Instead, I am simply reminding everyone that more significant results do require more time. Many years of bad habits cannot be reversed in a few weeks. You are going to need more time. Such a message may not be popular, but I’d rather offer the truth than see people continue to be deceived and discouraged. Fortunately, if you do remain consistent and diligent, real results will eventually come. What’s even better is that such results are much more likely to last when they are developed properly over time. Fitness should never be viewed as a short term sprint. It is a never ending journey that should continue throughout our lives. Health should not be viewed as something that you race towards with a stopwatch in hand. Life is much more enjoyable when you simply embrace an active lifestyle. The results will come in time, and you’ll be in a much better position (physically and mentally) when they do. I do live in the woods without TV and in some ways I’m glad I do. I have been exercising since I was a child and I’m now 46. I have been plodding for many years and will continue to do so I hope. However, occasionally I’m thrown off track by some new “brand” of exercise. Whatever form of exercise there is out there, someone tries to wrap it up nicely in a package to sell it. I would like to earn money from from fitness but how do you sell, “go for a run or get on your bike or do some push-ups or do some pull-ups”? It’s not rocket science. AS you say, it’s time and patience. And so as much as I have no TV, I think I need to ditch the internet too. I thank you for your simplicity. Thanks Ross for once again highlighting that consistency and patience are essential in life. The majority of people are like this, and not just in the gym. First thing I told them was the story of the ‘Tortoise and the Hare’. It seemed to do the trick. Some people do jepordise their health in the pursuit of acheiving an image given to them by the media and it is the job of trainers to advise and educate them. Matt mentions the simplicity of fitness, go for a fun, ride bike swim, do some push-ups. Take up a sport – it’s not rocket science. The industry aim is to capitalise on peoples lack of knowledge and sell a programme or product that promises the holy grail. Ross, once again you are the true voice of the industry. Your books and videos have dramatically changed my view towards health and fitness (this was way back in 2008) back when I was surrounded by the conventional bodybuilding dogma. I have been following this strategy of slow and steady for a few years. I understand that results take time but what do you do when you get unexpected results, and by this I mean injuries. You seem to be an individual that is in top shape with a vast knowledge of training methodologies, but what do you do for injuries or extreme soreness either from over-training or just plain bad luck. No two injuries are the same, so clearly each requires individualized attention. With that said, it is often possible to work around many injuries (at least to an extent). For instance, as a young fighter, I often had bad hand injuries. During those times, I would shift my attention elsewhere (ex. legs, core, etc.). I always opted to continue working what I could (safely), as opposed to giving up on movement as a whole. Thank you for shouting out this super important subject. 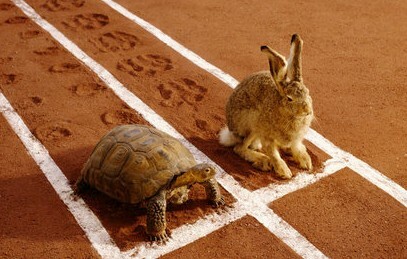 Trough the years i have noticed it is getting harder to keep my trainers in a slow, steady course towards their goals. In a world that all the media shouts: “here !, now !” the responsible coach has to become a mental coacher and educator first.